An enigmatic producer who uses live instrumentation, electronic sounds, and jazz theory to imbue his instrumentals with a warm musicality, Berkeley’s JULiA LEWiS (aka Benjamin Falik) is the go-to producer for the sophisticated side of Bay Area rap. Contrasting soft vibes and easy listening electric piano with overdriven bass and knocking drums, JULiA LEWiS celebrates the independent hustle on “Outta Pocket.” The single features a star turn from frequent JULiA LEWiS collaborator Rexx Life Raj, who strings together two tongue-in-cheek verses about the pros and cons of funding your own artistic career and delivers a sweetly sung hook, and a gleefully mischievous 16 from Oakland native Guapdad 4000. Premiered by L.A. Leakers, “Outta Pocket” is a bright and invigorating track, complete with a sense of humor and a playful array of counter-melodies. 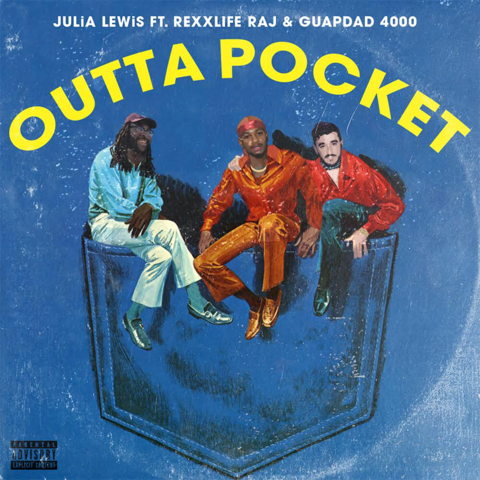 “Outta Pocket” is the latest in a strong series of singles for JULiA LEWiS, following the Yung Pinch & Larry June-featuring “Living Fast Sleeping Slow,” and “Pink and Blue,” which features appearances from Bosco, Duckwrth, and Jay Ant. Stay tuned for a new EP by JULiA LEWiS, coming soon. Benjamin Falik is ambivalent about the idea of personal fame. That’s one reason the producer, songwriter/producer chose the name Julia Lewis as a professional pseudonym: “It’s little bit of smoke and mirrors,” admits Falik, a Berkeley native. “I like playing with people’s expectations.” An accomplished student of jazz as a teen, the young musician eventually gravitated toward the experimentation of futuristic RnB and the urgency of hip-hop, insistent that he shouldn’t have to choose between Miles Davis and Mobb Deep. His uniquely organic and tuneful sonic footprint made him the go-to producer/ for singers like Joyce Wrice, Bosco, and Duckwrth – as well as rap artists like Rexx Life Raj, G-Eazy, Yung Pinch and Caleborate. “Handheld GPS,” which he produced for Raj’s debut LP Father Figure, has racked up 6 million plays on Spotify in the year since its release.